This 1920s style necklace by Lovett and Co is made from antique gold plated brass. It is 40cm in length with a 6cm adjuster. 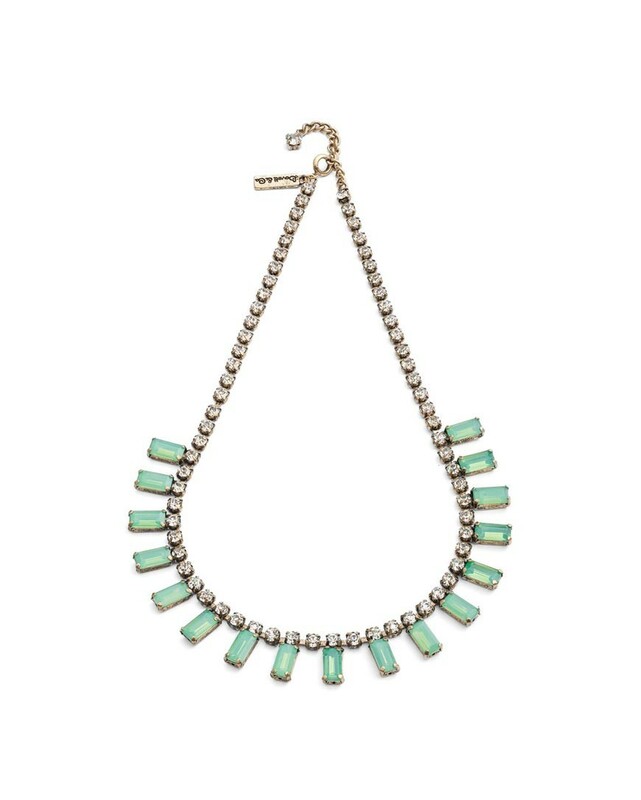 The main chain is embellished with round diamantes, with green opal rectangular stones at the centre. Matching earrings are also available for this style. These vintage style earrings by Lovett and Co are made from antique bronze plated brass with a rectangular light pink central stone with surrounding round clear crystals. They are for pierced ears. These vintage style earrings by Lovett and Co are made from antique bronze plated brass. They have a rectangular green central stone with surrounding round clear crystals. They are for pierced ears. This 1920s style necklace by Lovett and Co is 40cm in length with a 6cm adjuster. It is made from gold plated brass with a diamante chain with rectangular rose pink opals.